Until the 20th century, many farmers marked the bringing in of the harvest with a special meal for local agricultural workers. In Lark Rise to Candleford, set in rural Oxfordshire during the 1880s, Flora Thompson described the bustle of three or more weeks of hectic mowing, reaping and binding the corn, followed by the ‘harvest home dinner’ when all who had helped enjoyed ham, beef, vegetables, plum puddings and beer. The religious festival known as the Harvest Festival or Harvest Thanksgiving, following ancient custom is often held on the Sunday nearest to the Harvest Moon – the full moon occurring closest to the autumnal equinox (which falls on 22nd September this year). Traditionally churches are decorated with produce from the garden, allotment or farm, the food then distributed among the needy, or used to raise funds for the church, or charity. Historically gathering in the harvest has been the high point of the agricultural calendar and has been the theme of paintings and photographs for around 300 years, evocative images reflecting our rural heritage. 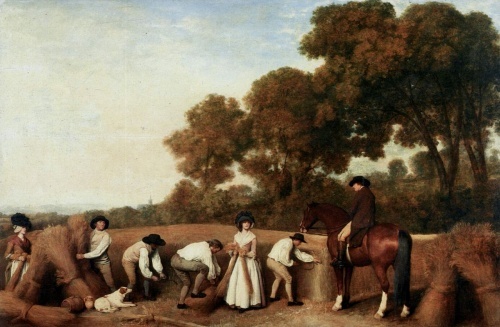 Early paintings include George Stubbs’ bucolic scenes of haymakers and reapers (1785), the men in snowy white shirts and slender breeches, the women wearing pretty gowns, fresh aprons and fashionable black bonnets. These are idealised images, and yet foreign visitors frequently remarked on the neat dress of field workers in Georgian England: for example, in 1748 Scandinavian horticulturalist Pehr Kalm was impressed to see Hertfordshire farm labourers wearing periwigs; later, in 1782, German traveller, Carl Philip Moritz, remarked that Berkshire farmers wore decent metropolitan-style garments and that there were no barefoot peasants in the fields, as elsewhere in Europe. In the 1700s and early 1800s men working in the fields wore sturdy knee breeches fashioned from hardwearing cloth or buckskin leather, often unbuttoned at the knee and usually teamed with leather gaiters protecting the lower leg. Footwear included stout shoes reinforced with iron nail-studded soles, short leather boots or, in some areas, leather-topped wooden clogs. Artworks and photographs usually show labourers without their coats, in shirt sleeves for heavy work, especially at harvest time, in the heat of summer. Breeches remained popular for farm work beyond their fashionable life, but eventually trousers became established as Victorian country wear. Gaiters were seldom worn with trousers, but land workers often tied their trousers below the knee with a strap, length of string, bootlace or straw, to free the knees, raise the hems out of the mud and, some say, to prevent field mice running up the leg! As farm wear evolved into a functional version of the urban male suit, garments were often fashioned from hard-wearing cotton fabrics, especially fustian, moleskin and the new corduroy, a durable, thick-ribbed cotton velvet. For summer, an unbleached drill (stout cotton) or lightweight canvas jacket was popular by the late-1800s - a casual, ready-made garment often termed a ‘slop’. Jackets and slops might be discarded during the harvest, but no man removed his shirt, as this was considered indecent. Summer straw hats were usually of the traditional broad-brimmed type, until smaller shapes became common in the early-1900s. The working man’s cloth cap was also a popular work style, whatever the weather. During the 1930s dungaree-style bib and brace work overalls were introduced as work wear, although many men wore trousers with the familiar knee ties, or new 20th-century breeches and gaiters, before the Second World War. Women helping with the harvest also wore clothes as practical as was permissible in their day. Summer work wear of the 1700s and early-1800s was typically a one-piece calico or linen gown, or a skirt and separate jacket-bodice or longer ‘bedgown’ - an informal thigh-length garment sometimes left undone below the waist. Both were protected by a waist apron, long aprons commonly hitched up sideways for easier movement. Country people didn’t always stand on ceremony amongst their own and historical sources suggest that in summer some women removed their gowns, working in the fields with a coloured petticoat pinned up between their legs, only a plain or checked kerchief and half-laced stays covering their shift, although special stout canvas over-sleeves were often worn during haymaking to protect the lower arms. Heads were covered with a white linen day cap topped with a hat – often a traditional wide-brimmed straw hat, although black silk hats in the late-1700s and poke bonnets in the early-1800s were fashionable alternatives. Another country style, popular from Scotland to Sussex, was a round bonnet with fabric hood gathered onto a cane brim: shielding eyes from the glare and protecting face and neck from sunburn, this later evolved into the Victorian sunbonnet. By the mid-1800s clothing styles were changing and the traditional working woman’s bedgown or jacket-bodice was no longer worn in England. Usually a regular day gown, unsupported by fashionable crinoline frame or, later, the bustle, was worn outdoors, made of plain, checked or striped cotton material in summer and protected by the ubiquitous apron. A distinctive cotton sunbonnet with curtains of fabric at the back developed around mid-century – an iconic item of country wear still worn at harvest time between the wars. In the 20th century a revolution occurred in the countryside as women took over much essential farm work during the two world wars. The Women’s Land Army (WLA) was formed in February 1917, its uniform a belted knee-length overall tunic, breeches (rarely worn by pre-war women), working boots, gaiters and a felt hat, with leggings and clogs also supplied in some areas during the summer of 1917. A new WLA was created in 1939, an official work uniform issued, although in practice for summer field work many wore a headscarf, blouse and dungaree-style overalls, sometimes adapting these to form shorts.